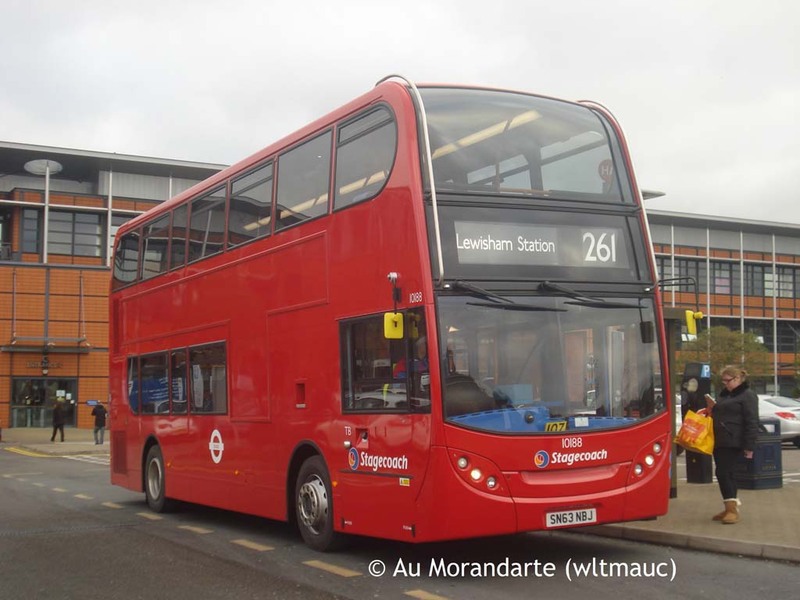 Quite a momentous occasion in December 2013 was the loss of route 261 from Metrobus to Selkent. The 261 was Metrobus’s second major London Transport bus route contract, following the 61 which was lost much earlier. Having been amongst the first routes tendered, it is one of the longest operated by a single operator other than London Transport and its successors. However, the return of the 261 to Bromley garage after 26 years will no doubt have been a major boost for staff there. The 261 was formed in September 1982 by amalgamating the middle section of route 94 (Brockley Rise – Lewisham – Grove Park – Bromley – Petts Wood – Orpington) with the southern section of route 47 (Shoreditch – Lewisham – Catford – Bromley – Farnborough), continuing to Orpington over the 51. The 47 was cut back to Bromley Common and the Petts Wood section of the 94 went over to new route 208. To begin with, the 261 was crew-operated by Routemasters, but inevitable conversion to one person operation in April 1983 resulted in conversion to single deck Leyland National operation, as these were the only buses available at the time! The Nationals were replaced by new Leyland Titans in the autumn of 1984, easing crowding, although the 261 has always been one of those routes that could just about cope with single deckers, and more were to follow. On 16 August 1986 history repeated itself, with the 261 cut back to Bromley Common (bus garage) and new route R1 taking over from there to Orpington (and on to Sidcup). This was part of the new ‘Roundabout’ local minibus scheme for the Orpington area, and was also the date when Metrobus took over the 61. 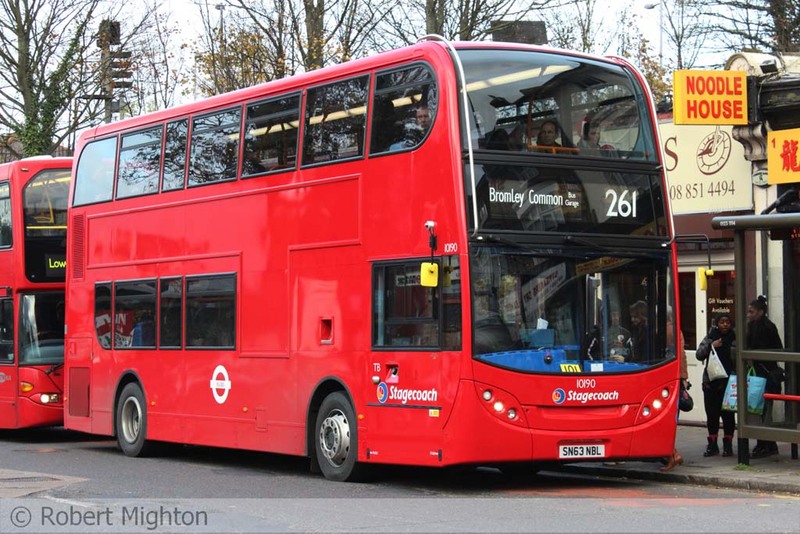 The 261 was part of the same tendering exercise, and retained by London Buses from Bromley garage. Concerns about loss of through links between Farnborough and Bromley, reduced to just one bus per hour on Green Line route 706 (later Kentish Bus route 402), saw a proposal to introduce new Monday to Saturday route 261A. This was awarded to London Buses, but the tight schedule involved contravened their strict union agreements, so the route instead went to Metrobus as the 361, from the same date 16/08/86. This was an hourly one-bus service between Green Street Green and Bromley North, interworking with the 706 to provide a half hourly service over this section. It seemed that London Buses had got its sums wrong for the 261 tender, and so it was re-tendered early, and this time was awarded to Metrobus with a start date of 21 November 1987. Thus the Titans on the 261 did not last long either! The route was further cut back to Bromley Common ‘Crown,’ the short section to Bromley garage having been operated only for operational convenience by London Buses. An unusual feature of the route remained however, with the enhanced Saturday frequency of 8 buses per hour as against 5 during the day on Mondays to Fridays. As a result the route required 14 buses on Saturdays compared with 9 during the week, but fortunately Metrobus’s commercial routes in the Croydon area were very heavily commuter orientated and most of the extra Saturday buses for the 261 could be sourced from these. Metrobus had put in three options as to vehicles, either new single deckers (Leyland Lynx) or new or second-hand double deckers. Typically, LT went for the latter option, but Metrobus, to its credit, got some nearly-new buses in the form of 1983 single door Leyland Olympians with Roe bodywork new to West Yorkshire Public Transport Executive, just slightly older than the Titans they replaced. These lasted until 1996, when a new contract began which specified new buses. Meanwhile, a new Leyland Lynx (F80 SMC) did enter the fleet, in September 1988, and was often used on the 361 where its brisk acceleration assisted timekeeping. From September 1987 a single journey on route 361 was back-projected from Green Street Green to Pratts Bottom, to supplement the 402. But from May 1989 the 361 was withdrawn in the early morning and late afternoon and all day on Saturdays. At these times, certain journeys on the 261 were extended to Green Street Green, including the Pratts Bottom journey. An hourly service was maintained on Saturdays, and the new arrangements allowed a more reliable service on a day when traffic was especially heavy and also allowed more economical use of resources. However, it did mean an increase in the number of single deckers on the 261 on Saturdays. But from November 1992 the 361 was withdrawn as were the Saturday shopping hours journeys to Green Street Green on the 261. Their replacement was a much enhanced service on Metrobus’s commercial route 358, which was also diverted to serve Bromley town centre. Early morning and evening journeys to and from the depot were however left in the timetable, and exceptionally these remained as late as February 2007, although the Pratts Bottom trip was curtailed to Green Street Green in 2001. Metrobus successfully retained the 261 three times, in autumn 1996, December 2001 and December 2006. In the 1996 change, the Saturday service was reduced to match demand more closely, with 6 buses instead of 8 per hour. This is still an increase on the 5 bph during the week, but meant that the route only required 10 buses (later increased to 11 for reliability) against 9 on Mondays to Fridays. However, the Sunday service was increased from every 30 minutes to every 20. New single door Volvo Olympians were introduced, these replaced by dual door versions, second-hand from London Central route 171, towards the end of the contract. The 2001 contract saw in improved timetable with an extra bus for reliability, and an afternoon journey extended to Green Street Green for the benefit of school children, providing an opposite facility to the morning journey (which was cut back from Pratts Bottom to start outside the Metrobus garage in Green Street Green). The Sunday frequency was further increased to one every 15 minutes. Again new buses were specified, low floor and dual door this time. Metrobus had settled firmly on East Lancs for its double deck bus bodywork, and initially bought Dennis Trident chassis. The buses followed a batch of similar buses for the 161, but were the last of the type before the decision to standardise on Scania chassis for double deckers. The 2006 contract change saw a more significant change in the shape of an extension to Princess Royal University Hospital in Locksbottom, requiring one extra bus. As well as providing a more convenient service to the hospital, this was partly to offset a reduction in frequency on route 61. However the journeys to and from Green Street Green were all withdrawn – the 358 has struggled to cope with the displaced passengers ever since! This change was postponed a few months, to start in February 2007. Once again new buses were specified, presumably because the Tridents had been leased and the expectation would be for them to return to the lessors; these were Metrobus's then standard double deck type, the Scania/East Lancs Omnidekka. So it must have been a huge disappointment for Metrobus to lose the 261 after all this time. The route once again passes Selkent's Bromley garage, which does indeed operate it. New E40D/Enviro400 double deckers have been obtained, and two views have been provided of this type. Firstly we have 10188 (SN63 NBJ) on the first day, 30 November 2013, at Princess Royal Hospital. This was built as a replacement for Bromley Hospital on the site of the former Farnborough Hospital. The Bromley site was far more convenient for patients, but presumably land values dictated the move. The second view is on the route's more traditional stomping ground at Lee Station (note the railway signal in the background). 10190 (SN63 NBL) was the first Selkent bus to run on the 261 as running number TB101, and was seen later the same day on a short working to Bromley garage. Hopefully this is not a case of a pre-1987 driver having forgotten about extension of the route to Locksbottom! One change made with the new contract is that the Saturday frequency was reduced to match the Monday to Friday level – ironic that Metrobus managed to source the extra Saturday buses from its more restricted fleet throughout its tenure, but that requirement no longer exists now that it is operated by Selkent, which has rather more buses spare on a Saturday. Another change made was to add a further extra bus in the afternoon peak to aid reliability (the extension to Locksbottom should probably have had 2 extra buses rather than 1). 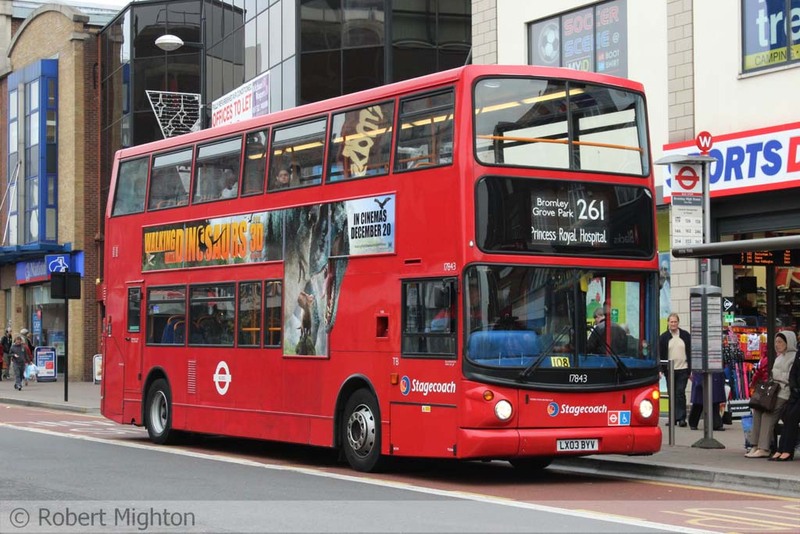 This is sourced from the school routes at Bromley garage and as such is an older Trident/ALX400 working as TB501. 17843 (LX03 BYV) was the first Trident on the 261, in fact running as part of the main allocation as TB108 in Bromley on 2 December 2013, freshly equipped with white on black blinds so as to incorporate the 261 in the destination set.